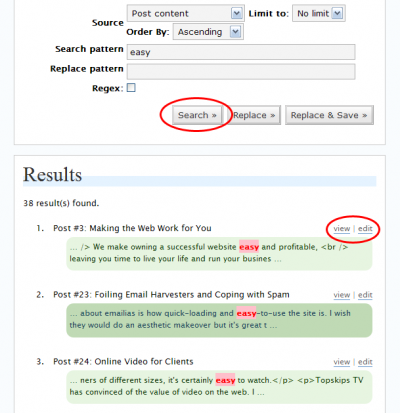 If you are replacing some text, first enter the Search pattern and press the Search button. This will show you the results, so you can fine tune the pattern to get only the results you want. You also get a set of links to view and edit the post. Very handy. 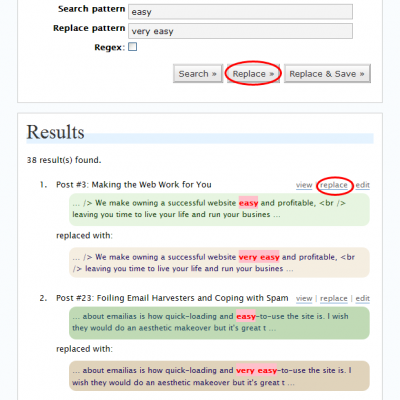 If you are satisfied with your search results, you can enter the Replace pattern. Then press Replace button. You will get all list of all the search results together with the preview of how the text will look like after the replace. 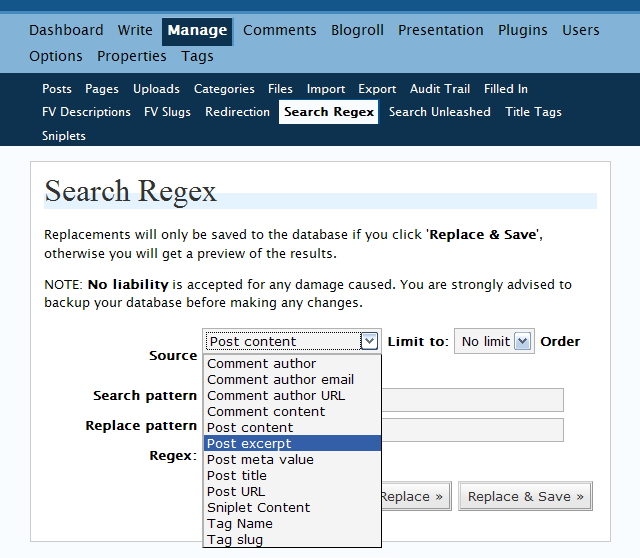 Now you can manually decide if you want to replace each one of search results by clicking replace. 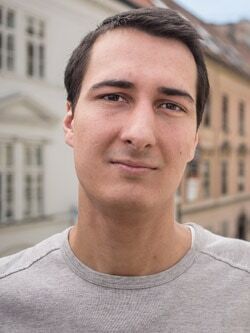 Replacing the word in Post content is often not enough, if you don’t also search Post title and Post meta and Post excerpt you will miss instances. While it’s possible to have changes made immediately (Replace All), we recommend you that you avoid Replace & Save, as this will alter your posts immediately. Use only if you are 100% sure what you are doing and you have a huge number of changes to make. 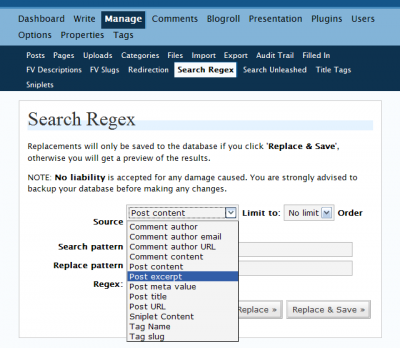 Search Regex has even more powerful replacement options, via regular expressions. 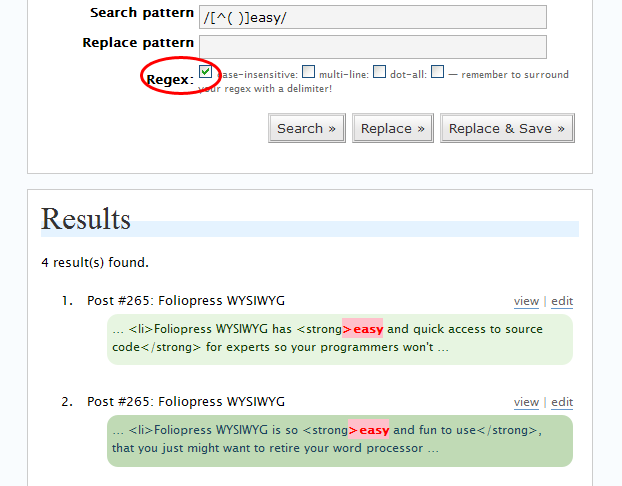 If you have some programming skills and you understand Perl compatibile Regular Expressions you can check Regex checkbox and extend the functionality of this great plugin. 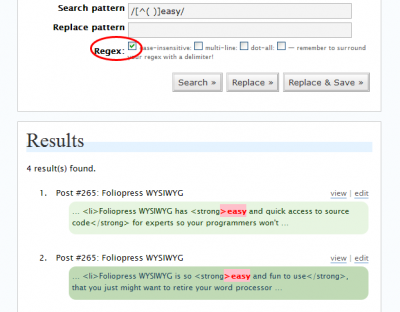 Regular expression on the following screenshot will search for every occurance of word ‘easy’ without blank space before it. So remember to be extra careful when using the replace function and good luck fixing your articles. but always return nothing, i search the plugin developer site, but he didn’t reply the question of this kind of problem. can you help me?